So someone needs to call Jason Derulo a stylist because the poor guy seems to now be taking his fashion advice from Kim Kardashian: Hollywood. At the MTV VMA red carpet pre-show, the R&B singer wore an all-white suit with chains, a look that one smart Twitter user very smartly pointed out looks exactly like an outfit straight from Kardashian's popular smart phone game. Derulo's girlfriend Jordin Sparks was also dressed in white so either the couple are trying to hint at a possible wedding or matching with your beau is a trend at awards shows. The real question is why would Jason Derulo choose the all-white look when Kim Kardashian's game has so many interesting looks to choose from for men and women? There's the red hoodie, creepy silver beads, and black beret look that this "fashion foward" guy is wearing in the game. And if you're at the VMA's or walking around Hollywood in the Kardashian game, you apparently can't go wrong with a good fedora. 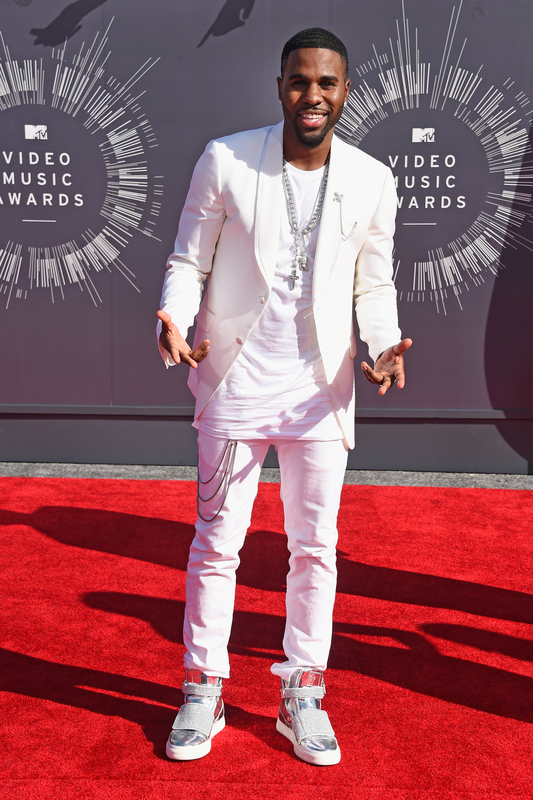 I think in the end, this white-on-white-on-white look works for Derulo. Though next time maybe it would be better for him to check with Kim Kardashian and make sure she's alright with him not only borrowing her game's look but also clothes from her husband's closet.